Want to eat healthily, but worried it will cost too much? Looking to save on grocery bills, without compromising on nutritional value or flavour? Whether you're living on a budget, trying to cut back on spending, or simply looking for healthy and inexpensive recipes, you can find what you need in this highly informative book. 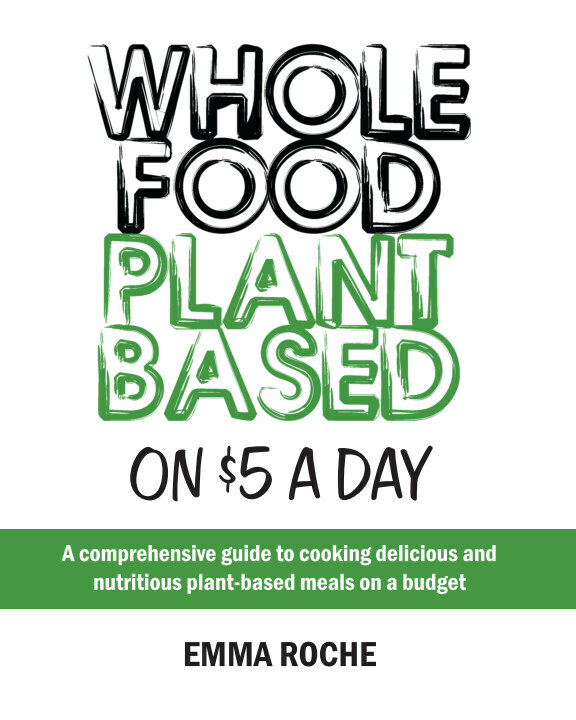 Written by PlantPlate founder Emma Roche, "Whole Food Plant Based On $5 A Day" is a comprehensive guide to eating nutritious, filling and flavourful meals on a budget. With 30 easy-to-prepare recipes, it's perfect for both beginners and well-practiced cooks. The book is designed as a 4-week menu plan, complete with all grocery lists, recipes, daily preparation instructions, money-saving supermarket tips, kitchen and cooking guides, and more! The recipes are 100% vegan (plant-based), and made without added oils. It's proof that you can eat better, spend less, and feel good - starting today! - - - - - PLEASE NOTE: Main prices are in US dollars and based on US supermarket prices. Weekly price guides are also provided for readers in Australia and The UK. This book features exactly the same content as the original eBook version of 'Whole Food Plant-Based on $5 a Day'.